Wash your windows with a new cleaning technique that has met the demands of over 94% of our customers in Oakleigh! Q: What does the window cleaning in Oakleigh involve? A: Our service will be carried out by seasoned and fully vetted Oakleigh window cleaners. They'll also don branded uniforms, so you'll easily recognise them as soon as they arrive at your premises. A: In essence, this is a lengthy pole that shoots water under powerful water pressure. It allows the experts to reach the fourth storey of any commercial or residential building without having to climb the rooftop. A: Not at all! The team will utilize a special de-mineralised water tank inside their caravan. However, if the tank is empty, we will readily take your offer. A: You must make sure that there will be a unoccupied parking space within 30 metres from your premises and on the same side of your windows. The experts also need to have a free access to your property. With our window cleaning in Oakleigh, you get a quality wash of your sash windows, skylights, glass roofs, French doors, and other glass surfaces at budget rates. We will even present you with a free wash of all PVC & UPVC frames and sills! For a complete list of our prices, please check our price table below. No matter where your stains have taken refuge, our resourceful window cleaning in Oakleigh will eliminate them with ease. We have included various cleaning methods. 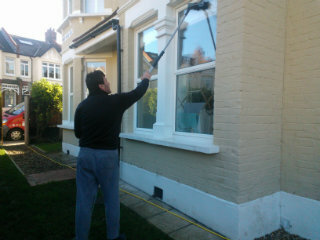 Our external window polish is aimed at properties with no more than four floors. To let the sunshine back inside, the window cleaners in Oakleigh will arrive in a caravan, outfitted with a retractable water-fed rod. This equipment is attached to a water tank, filled with distilled water. After being released as a powerful flow from the pole's brush-head add-on, the water will absorb all dust build-up in an attempt to renew its original structure. To access dusty window corners of multistorey structures, we'll send a seasoned team for rope access window cleaning. These approved climbers will utilize well-maintained ropes and harnesses or deploy ladders and cherry pickers to bring back the glamour of your panes. We've got all important COSHH reports in place and follow every safety requirement. To make the in-house surface of your window façade just as shiny, the experts will depend on the ordinary ladder and squeegee cleaning procedure. In our mission to cater to as many Londoners as we can, we've widened our window cleaning in Oakleigh to cover extra areas across London. For your comfort, we've included the names of these nearby locations below. Another quick and easy way to get a free instant quote or to book window cleaning services Oakleigh N20 is through our web site.